Georgia Tech is located in midtown Atlanta. Hartsfield-Jackson International Airport, the busiest passenger airport in the world, is just 10 miles from campus, with direct service to most US cities and many international destinations. From the airport, the best way to get to Georgia Tech is via the MARTA train. MARTA trains depart from inside the domestic terminal of the airport, near the baggage claim. If you arrive in the international terminal, take the free shuttle bus to the domestic terminal to take MARTA. Take any train departing from the airport station to the Midtown / 10th street station. The ride lasts approximately 20 minutes. The fare is $2.50, plus a one-time $2.00 fee to purchase a reloadable Breeze card. If you prefer, taxi service is also available from taxi stands in both the domestic and international terminals. Taxis to midtown are a flat $32 fare (plus tip and fees for additional passengers). If you arrive on Sunday and are looking to meet other WAC attendees, we recommend that you go to Marlow's Tavern for dinner and/or drinks. It is located at 950 West Peachtree Street, at the corner of 8th Street. This is not an official conference event, but several members of the organizing committee plan to be there between 7 and 9 pm. Ask the restaurant to be seated at the Web Audio Conference tables! Registration opens at the Academy of Medicine at 8 am on Monday, April 4th. A continental breakfast will be available. The first conference event begins at 9 am on Monday, April 4th. This Google Map shows key WAC venues. This WAC Local Map shows restaurants and amenities within a few minutes walk of the Academy of Medicine. The conference hotel, the Midtown MARTA station, and the Academy of Medicine are all a short (< 5 minute) walk from each other. On Tuesday night, the conference dinner, concert, and reception will all be held on Georgia Tech's central campus. To get to central campus, you can walk (~15 minutes) or ride the free Tech Trolley, which stops at both the Academy of Medicine and the Midtown MARTA Station. After the concert and throughout the reception, a dedicated shuttle bus will run from the student center (site of the post-concert reception) back to the conference hotel from 9:30 pm to 12:15 am. For more details see these full directions. 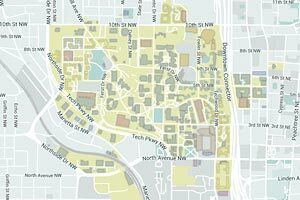 This interactive Georgia Tech campus map shows all major facilities on the university's campus. These campus transit maps show the routes of free shuttle bus service throughout campus: the Stinger (East Campus only) and the Trolley (includes the Academy of Medicine and Regency Suites / Midtown MARTA Station). The Monday and Tuesday evening concerts are free and open to the public. If you wish to bring additional guests to the the Tuesday evening pre-concert dinner and post-concert reception, please purchase guest tickets on the registration page. Guest tickets include the Tuesday pre-concert dinner in the College of Architecture Courtyard and the post-concert reception at Tech Rec. Additional guests wishing to attend other conference events must register at the regular registration rates. The conference hotel offers overnight parking to guests staying in the hotel for an additional fee. Georgia tech offers paid daytime visitor parking. The closest visitor parking lot is at 828 West Peachtree Street NW (entrance on 5th street between West Peachtree and Spring Street). This open air lot is two blocks south of the Academy of Medicine. The official hotel of WAC 2016 is the Regency Suites Hotel. The hotel is located directly next to the Midtown MARTA station and three blocks from the conference venue, the Academy of Medicine. You can book at the conference rate of US $129 per night (king or queen bed) or $139 per night (two double beds) plus tax. Click here to reserve your room and use promotion code FOI. We have set up a Google Group to help conference attendees find roommates. All attendees are expected to abide by the conference code of conduct.